In NES Replay, we go through each NES game from A-Z to see if they're any good. Today: Adventures of Lolo 3. I'm running out of things to say about Adventures of Lolo. That's not because these games are bad. Not at all. They're a lot of fun, each and every one of them. It's just that they all have the same mechanics, with very little deviation. I could show you three separate screenshots of Lolo games, and you would be hard-pressed to figure out which one belongs to which game. However, that doesn't stop me from declaring Adventures of Lolo 3 as the best Lolo game of the bunch for two simple reason: It eschews the "lives" system and introduces an overworld. The Lolo series is all about planning, experimentation and trial-and-error. Since previous games only gave you five lives to play with, you had to be a lot more cautious, which means you're experimenting less and having less fun. It also makes things exponentially more frustrating. Since Lolo 3 removes the lives system entirely, you now can play with more trial-and-error and testing out new ideas. Lolo 3 is still difficult like the first two games, but in a much less frustrating way, and it all comes down to them removing the "five lives and you're dead" system. Lolo 3. You can tell by the pixels. The overworld is also a seemingly minor addition, but it also adds a feeling of progression. You're not just solving puzzles in one endless tower, but a succession of smaller towers. It's a tiny little change, but it's significant. You feel like you're moving forward to some degree and it actually makes Lolo 3 a lot more fun. 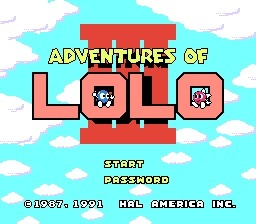 If you're at all interested in playing this series, I would say that Adventures of Lolo 3 is the place to start. It's fun and fair without being frustrating. It's just as mind-bending as the previous entries, and if you like it, you'll have fun solving more puzzles in the other Lolo games. I'd like to talk about one more thing, if you'll permit me. Lolo used to be HAL Laboratory's mascot before Kirby waltzed on to the scene. Lolo and his female companion even make an thinly-veiled appearance in a few Kirby games as enemies as well. So who owns the Lolo series now? HAL is a wholly owned subsidary of Nintendo, as far as I know. Did HAL Laboratory's IP go with them? Does Nintendo own Lolo? If they do, why the heck haven't they revived this series? 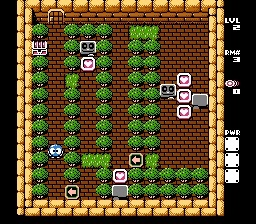 I mean, wouldn't a revived Lolo game be perfect for the eShop? Get on it, Nintendo! Either way, if you like puzzlers, the Lolo series is a ton of fun, and Adventures of Lolo 3 is a standout. Looking for more NES games? Click here for more! All posts Copyright 2014 Downwards Compatible. Picture Window theme. Powered by Blogger.